The American Civil War claimed the lives of over 820,000 Americans, including some 30% of all Southern men between the ages of 18 and 40 and 10% of all Northern men between 20 and 45. It ran for 4 years and encompassed as many as 10,000 battles. It was fought over vast areas of land and, if anyone had been paying attention in Europe, presaged many of the military and technological developments that were later to turn Northern France and Belgium into the charnel houses of the First World War. By any measure, this was a major historical event, either the first modern war or the last old war, depending on your point of view. It remains the only large scale, civil war fought in a democratic nation. Yet I, like most Britons, was almost wholly ignorant of it. Sure, I had heard of Gettysburg and Antietam. I knew about Lincoln, that he made the Gettysburg Address and that he wanted to abolish slavery in the South. The names of Jackson, Lee and Grant were familiar. However, I really didn’t know much about it, certainly by comparison to the Napoleonic Wars or the First and Second World Wars and, as a keen reader about history felt this gap in my knowledge keenly. 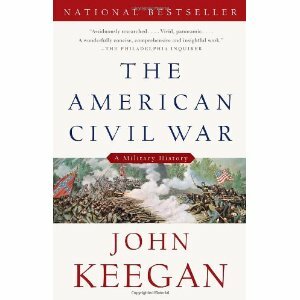 So, a Christmas gift of Sir John Keegan’s single-volume history of the American Civil War and the fact that the Civil War forms the War Through the Generations 2011 theme gave me the kickstart I needed to start finding out about this conflict. For those of you who are not aware of him, Sir John Keegan is a British military historian who is widely regarded as one of the leading military historians of our time. His book, The Face of Battle, has been credited with changing the way in which historians approach the writing of military history and, in addition to having been the senior lecturer in military history at the Royal Military Academy, Sandhurst, he has also held professorships at Yale and Vassar colleges in the US. With this pedigree and having enjoyed several of his earlier books, I was really looking forward to his take on the Civil War. I thought that, as a non-American writer, he might have a fresh perspective to bring to the table. Yet, overall, I came away feeling slightly disappointed. The American Civil War is not, strictly speaking, a narrative history of the war. It sets out to answer certain questions relating to the war such as why was the war fought the way it was, could the South have ever won, why did members of the same nation fight each other so intensely. Nevertheless, in order to answer these questions, it was necessary for Keegan to deal with the chronology and this is where the problems start. The book seems to be split into roughly three sections: six chapters setting the scene and dealing with the run-up to the outbreak of war, 9 chapters dealing with the chronology of the war and then 6 thematic chapters dealing with specific aspects of the war such as the experience of the black soldier, the military leaderships of the two sides and a quirky little chapter on Walt Whitman. The book ends with a rather cursory chapter wrapping up the end of the war and setting out some of his conclusions. This structure creates two problems. Firstly, it is, frankly, impossible to cram a proper narrative, even in summary form, of the Civil War into 9 chapters of a book which is only 365 pages in total. The amount of information he has had to cram into this part makes it confusing and difficult to follow in parts and, conversely, he has had to leave out so much that it becomes unhelpful to the novice and facile for the expert. Having said that, his section on the Battle of Gettysburg is a wonderful piece of descriptive writing. The second problem with the structure is that of repetition. As he moves from the narrative to the thematic chapters, he is forced to repeat much of what he has said earlier in order to explain his themes fully. This is very irritating. Where Keegan is excellent is in the insights he brings to the war. He is able to use the breadth of his historical knowledge to draw comparisons with other conflicts ranging from the Napoleonic Wars through to Vietnam. He also emphasises the degree to which the war was dictated by the physical geography of the theatre of war. Not only did this drive the strategy of both sides but it also impacted upon individual tactics and was a key factor in the number of casualties. Keegan highlights Grant’s ability to deal with the topography of the battleground as one of his leading qualities. Keegan is very good at analysing the various military commanders on each side. His conclusion is that there were two outstanding Union commanders in Grant and Sherman and one on the Confederate side in Lee who he rates just behind the Union two. Otherwise, he is rather dismissive of the majority of the main generals, especially on the Union side. His admiration of Grant knows no bounds and he skims over his willingness to send large numbers of men to their deaths. Indeed, Keegan contends that driving the body count up on both sides and the depredations of Sherman’s March to the Sea were necessary elements of the Union’s eventual victory and appears to approve of Sherman’s notion that the war had to be carried to the civilian population of the South, although many Americans might bristle at his comparison of this to Hitler’s progress through Eastern Europe in 1941. Nevertheless, there are echoes of what would become known as total war in Sherman’s campaign and Keegan has a point when he says that the key to victory was not to destroy Confederate cities, industries or even armies but to break the Southern mind. "The Great War is always spoken of with regret in Europe. It is the Continent's tragedy, the cause of many of its persisting troubles, the war without justification or point. No such regrets attach to the Civil War, which is remembered as the struggle which completed the Revolution and made possible the realisation of the ideals on which the Founding Fathers launched the republic in the 1770s." Unfortunately, Keegan’s insights and analysis are outweighed by contradictions in the text and also a number of fairly fundamental inaccuracies. By way of example, he comments on the deep hostility that existed between soldiers on the two sides by stating that the Union treated the Confederate dead worse than the Germans and the Western Allies treated the dead of the other side in the World Wars but then misinterprets Lincoln’s Gettysburg address by claiming it was reconciliatory. He argues that it praised the dead of both sides when even I know that it was only aimed at the Union dead. Also, and most egregiously for a British historian, he not only gets the name of the British Prime Minsiter of the time wrong but also places him in the wrong political party. Not good at all. When Keegan’s book came out around eighteen months ago, it had a mixed reception. The non-American press (mainly British and Australian) gave it broadly favourable reviews whereas American reviewers were largely critical, notably this scathing (and a little mean-spirited) review by James McPherson in the New York Times. Some blog commentators even went as far as to claim that non-Americans shouldn’t write about the Civil War, which seems a little parochial and small-minded to me. Ultimately, I think The American Civil War has to be judged a failure and a rare disappointment amongst Keegan’s oeuvre. I shall be turning later in the year to McPherson’s Battle Cry of Freedom to be my narrative guide to the Civil War and will also be reading Amanda Foreman’s A World on Fire. This is a transatlantic view of the Civil War, dealing with the way Britain reacted to it and how it affected relations between the two countries. If you are new to Keegan, do not be put off but, instead, turn to either The Face of Battle or The Mask of Command, both far better pieces. I haven't read Keegan yet and am glad to hear a reasonable review. For a very different perspective on the Civil War, try the work of Drew Faust. She's brilliant and I love her work. Lifetime Reader - thanks for the recommendation. I will certainly look for her books. Well, check me out - all Kindle'd up! Top Ten Tuesday: Are you in the mood for lurve?